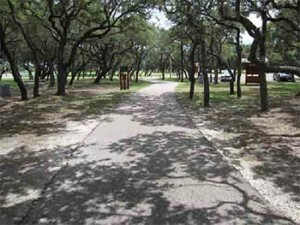 Memorial Park has a beautiful 1.6 mile asphalt trail that winds through live oak habitat and around a 2.6 acre lake. A 1.6 mile loop trail serves as the passive recreational backbone of the park and meanders around the baseball and soccer fields and thru live oak motts located throughout the site. The trail is an eight foot wide multi-use asphalt trail and consistently has heavy foot traffic. The trails are lighted and are accompanied by benches and pet waste stations to support use of the trail. To the north of the trail is a triangular section of the park that is approximately 3.6 acres. The loop trail is located on the perimeter of this area, which also includes a picnic pavilion. In the center of this area is a conglomerate of individual exercise stations. While in fair to moderate condition, the equipment is rarely used – making this area interior to the trails one of the most scenic yet under-utilized portions of the park. The backbone of the west side park amenities is the large pond. The pond serves as a drainage basin for a high percentage of the west side park acreage and usually has water of some capacity. Overflow from the pond is to the east. Bird and water fowl frequent the pond and the wetland area to the west of the formal pond area. 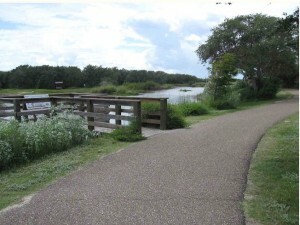 An existing asphalt trail hugs the north side of the pond and there are several overlook areas along the trail that take advantage of the aesthetic nature of the pond. The trail continues on the south side of the pond although a little further removed from the pond’s edge. A trail head is located at the east end of the pond with parking accommodating approximately twelve vehicles. Vehicular access to this trail is thru the main park access drive on the east side of the park and a rest room facility supports the trail head. Both the rest room and parking area are in good physical condition although there is very limited security lighting in this area. There are additional soft surface trails that tie into the main asphalt trail. 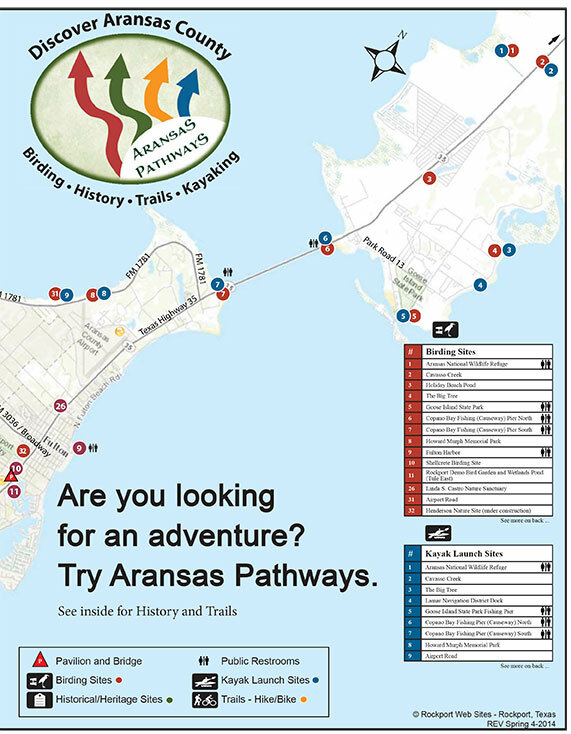 These trails are comprised of compacted mulch and although they are located on very flat terrain are not considered accessible.